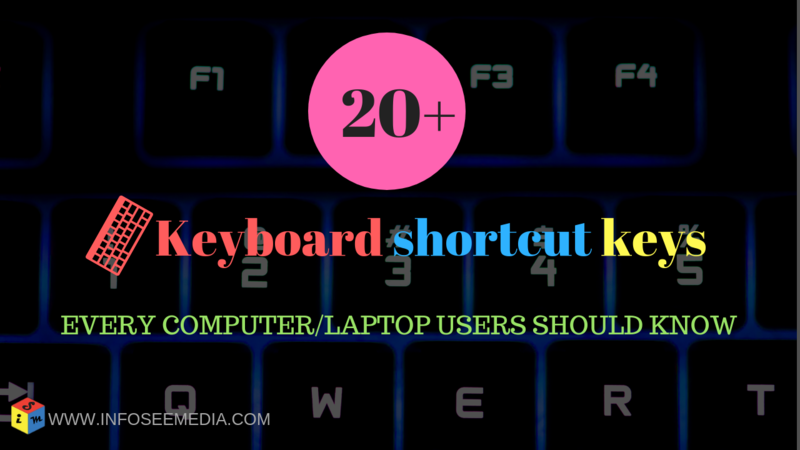 Here I will tell you 20 keyboard shortcut keys which will make your works faster and better. So lets go. This shortcut key is basically used to switch the programs in computer/laptop. Suppose you have opened many programs/tasks in your computer, and you want to switch your program from one to another then you have to click Alt+Tab at time to switch the tasks. Generally you should using your mouse to power off PC/Laptop. But did you know you can shutdown your keyboard in seconds with Alt+F4 key. To do this just press Alt+F4 then Enter key. Also you can close the running program by pressing Alt+F4 at a time. Window+D : Minimize all running programs. This is one of the very useful shortcut key of which very few people know about. If you are doing many multitasking at a time and you want to minimize all of them in a second, then you can use Window+D shortcut key to this. F12 : Use Save As option directly in MS Office. You should be using Save-As option in MS Office by making 3-4 steps. From now you can do it from 1 step. In PC press F12 do complete save-as job. In Laptop you have to press Fn key first and then press F12 key to complete this job. Don’t use mouse to create New-Document Ms Office Software. Just press Ctrl+N at a time to create new document. From now press Ctrl+S option to save a ducument. Generally everyone opens a new tab in their browser by clicking + sign which was present near the opened tabs. But there is a shortcut key also there to do this and that is Ctrl+T. Open History page in browser. To open history page you should several steps like going to menu then clicking history option. To open History page directly, press Ctrl+H and it will be open in a second. Delete Browser history data or cache data. To delete browser cache data or history data with shortcut keys just go to the history or cache page and press Ctrl+Shift+Delete keys at a time. Open New tab in Incognito Mode. Press Ctrl+Shift+N to open new tab in Incognito Mode. Whatever yo do or search in this tab, your browser will not save it in its history. Open Download menu in browser. To check what have been downloaded in past and what is now downloading you have to open download menu/window in browser. to do this a keyboard shortcut key is there and that’s is Ctrl+J. If there is page or website which you visit regularly, then you should bookmark it by which you can visit that site by one click. You can do it through mouse, but there is a shortcut key by which you can do it through keyboard which is Ctrl+D. Easiest way to open the link in new tab is press the CTRL and click the link with mouse that’s it. Open the tab again which was accidentally closed in browser. This was the one of the important Shortcut keys ever. In many times we open many links in many tabs, while closing them some time we closes the important tab which we also opened in that browser. But there is aKeyboard shortcut keys to back up that tab and that is Ctrl+Shift+T. After press this the last closed tab will appear again. In sometime when you running a program in computer and the program get hanged or not responding. In this time you can’t able to close the program by clicking close option. At that time you have to open task manager and close that program from task task manager. To open the task manager you can use the keyboard shortcut key Alt+Ctrl+Delete. The Keyboard shortcut keys to Undo the task is Ctrl+Z. The Keyboard shortcut keys to Redo the task is Ctrl+Y. When you want to select document or files or anything at a time you can press Ctrl+A to do that. First you have to select the document or anything which you want to cut copy or paste. Press Ctrl+X to cut or Ctrl+C to copy that selected document. Then go to the place where you want to paste it and press Ctrl+V to paste the cut/copied document. Note: There are lots of more keyboard shortcut keys are there [Check all] , but which I have sh showed here are important one. Just practice this and you will become a keyboard master.